Oracle Enterprise Manager 11gR1 Grid Control provides a web based interface for managing a Data Guard environment. Many Data Guard management functions can be accomplished with just a few clicks of the mouse and changing the Data Guard Protection mode is one of those functions. 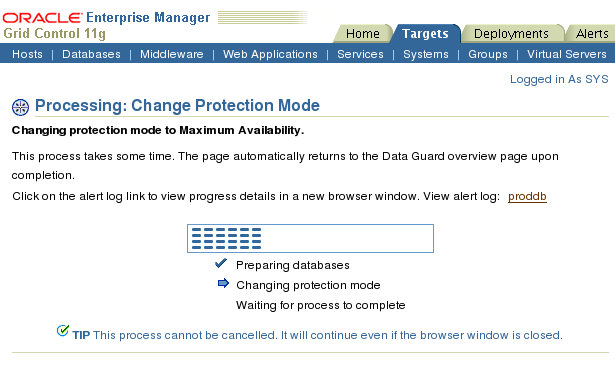 This document will detail the steps to change Data Guard Protection mode using Oracle Enterprise Manager 11gR1 Grid Control. 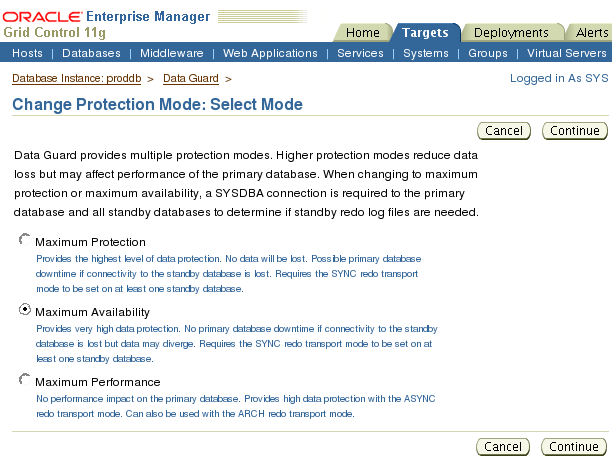 For more information on the protection modes see the post Changing the Data Guard Protection Mode . If you would like to see how to change the protection mode using the Data Guard Command Line Interface see the post: Changing the Data Guard Protection Mode Using the Data Guard Command Line Interface. Navigate to the primary database home page and click on the Availability link. On the Availability page click the Setup and Manage link under the Data Guard section. The Data Guard page contains many features to manage your Data Guard environment. On this page you can add standby databases as well as perform switch over and fail over operation. For now we are concerned with changing the Protection Mode. In the Overview section you will see that the protection mode is displayed as link. Click the Maximum Performance link. 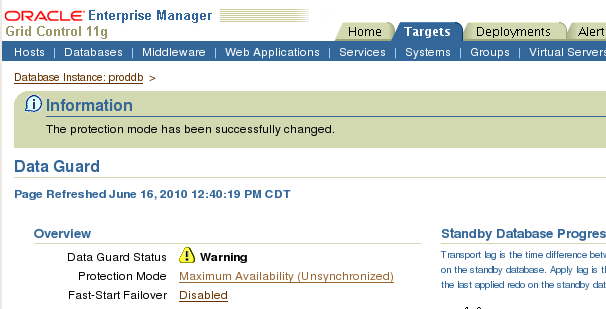 On the Change Protection Mode page each protection is briefly described along with stating the required redo transport mode. In this example we will be changing to Maximum Availability mode as Maximum Protection Mode requires a restart of the database. Make your choice and click the Continue button. 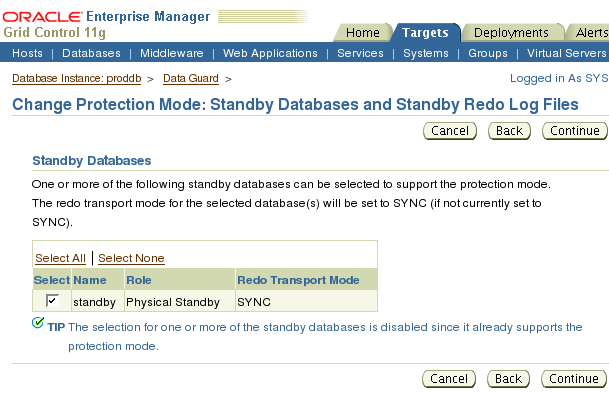 On the Standby Databases and Standby Redo Log Files page you can select the standby database(s) in which to change the redo transport mode to SYNC. Make your selections and click the Continue button. The Confirmation page is the last page prior to making the change. A progress screen is displayed next that provides an overview of the steps taken to change the protection mode. Once the process completes you will be taken back to the Data Guard page. An information message will appear stating the status of the change. You might see a warning such as the one above when the change of protection mode completes. In this case the standby is not completely synchronized at this time and there is a gap. The time for the synchronization to complete depends on how much redo needs to be transferred and applied to the standby. In this case the synchronization was complete in the time it took to refresh the page. Changing the Data Protection Mode using Oracle Enterprise Manager 11g Grid Control is a simple process that can be accomplished very quickly.